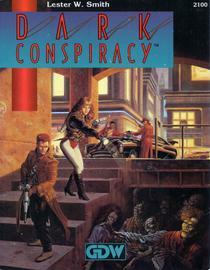 Dark Conspiracy shares the same rules set as Traveller: The New Era and Twilight: 2000. 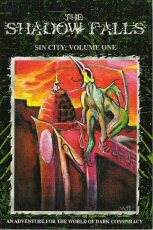 It's of the genre I think of as "Techno-Horror," a modern-day Call of Cthulhu (See: Delta Green ), and pre-dated the X-Files TV series (1993-2002). We had some discussion about how we wished we could keep DC going to take advantage of the players telling us, "Hey, you can play X-Files with this," but with the departure of Les to TSR we didn't have the staff to keep it all running, and had to focus our efforts on other things. "Something very strange is going on. Stranger than usual, I mean. Hell, I'm used to eco-commandos dynamiting oil refineries. I'm used to riots in the Farm Family Relocation Camps. I understand the wars that street gangs and corporate security goons are fighting for the inner cities. I can accept the steady breakup of the old nations, even if I can't pronounce half the names of the new ones. I'm even used to grave robberies and blood bank heists in California. After all, it's California, right? But a few days ago, the Eastern Australian Air Force nuked Melbourne, and refuses to explain why. Black, spiky things that only vaguely resemble fish are attacking people in the Great Lakes. A radio station in Chicago is broadcasting only a single, oscillating tone — all day long. Whole blocks of Mexico City have been abandoned — by people, anyway. My contact in the Michigan Secret Service said we're being invaded, part of a centuries-old plot. I wanted to find out more, but before we could meet, he turned up headless in a park. Shapes that rip and tear. Shadows that live in corners. Windows in space and time that lead to realms of madness and decay. A dark lurking horror that feeds off the echoing anguish of a billion tortured souls. This is the center of a twisted, sinister conspiracy which threatens the very existence of all humankind. Set in the near future, the world of Dark Conspiracy is dramatically altered from today and is fraught with peril and challenges. The Metroplexes, where most of the world's population lives, are a blend of lawless gang turf and corporate fortresses ruled by men and women powerful enough to be above the law. The countryside is sparsely inhabited, its natives suspicious and violent. And increasing areas of countryside are turning into Demonground, from which few humans return. When an ancient, brooding evil is released from its dimensional prison, humankind's worst nightmares come to life. What is the link between this sinister horror and the mysterious holes in the ozone layer, the rise of empathically aware humans, and the alien visitors from another star system?" "Something's prowling the fringes of the city. Something from the swamps, something old and wicked, with a legion of servitors at its disposal. People in the outlying ghettos have been disappearing, the only clue to their fate a thin trail of blood and stagnant water leading to the sewers. A panic is seizing the city. Fistfights and street battles are occurring at an increasingly frequent rate. It's becoming difficult to travel from one sector to another without a well armed guard. Now someone is dumping tons of toxins into the swamps, leaving dead wildlife bloating in the hot Louisana sun. And the megacorps are blaming it on one another. Can you unravel the mystery, without falling prey to the deadly swamps, the secretive corps, or the panicked citizenry of New Orleans?" "Behind the shadows of our world, the Dark Ones lurk, plotting humanity's ruin. Their Dark Minions stalk us, armed with horrific devices, the products strange and hideous sciences. Human agents capture what they can, hoping for weapons that will aid them in their fight. And in some secret strongholds, individual ETs who have escaped the darkness labor side by side with human scientists, creating items to hold the Dark Ones off. Meanwhile the megacorporate sector pursues technologies that pander to the wealthy. For many, HiTek is the truest symbol of high status. Worn like a coat of arms, it distinguishes the movers and shakers from the increasingly disenfranchised hordes of 'commoners' below. 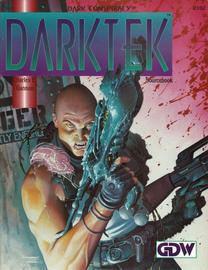 In this volume, you will find items ranging from the gruesome biologic weapons of the Dark Minions, to the futuristic constructs of the ETs, to the most advanced in human technology. But all belong to the world of Dark Conspiracy, a world that is itself ever more a product of DarkTek"
"FOR A THOUSAND YEARS the Dark Lady, a sorceress of ancient Baghdad, has lain in mystic stasis, her mind imprisoned through the power of a legendary gem. FOR A THOUSAND YEARS a hideous race of parasites has chafed at the wards barring them from Earth, and has labored to aid the Dark Lady who could free them. FOR A THOUSAND YEARS the Servants of the Dark Lady have sought to destroy the mystic opal called 'Heart of Darkness,' to release their evil mistress into the world once again. FOR A THOUSAND YEARS the Brothers of Ahmed have dogged the heels of the Servants, seeking the knowledge to destroy the Dark Lady for once and all time." "Through the millennia, it has known many names: Set, Surtur, Hel, Kutulu, Tiamat. The legends of this being stretch back beyond the memory of humankind. It is the Great Dark One. The source of misery, the bringer of despair, and the wellspring of human suffering. Imprisoned in ages past, it has bided its time. When humans crawled from the evolutionary muck, it waited. As the first civilizations arose, it waited. When humanity first reached out for the skies, it waited. It waited for a time when it could be free to rule and torture. That time has come. NASA's newest Comsat is beaming a strange and unknown signal to Mexico. The gods of the ancient Mayans are rising anew. Strange and horrible creatures stalk the night. These disparate threads hold the secret of the Dark One's return. The way is open for the coming of the Great Dark One. Hidden away in this tangled skein of threads lies the terrible secret that can breach the walls of reality and herald the arrival of the greatest evil ever known. "This first Dark Races Compendium is designed to maintain that sense of horrifying mystery central to Dark Conspiracy adventures. 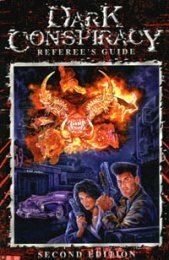 Within the pages of this volume, referees will find more than 50 Dark Minions from the feverish visions of a dozen and a half different authors. Many of the creatures herein are the stuff of often-repeated legends of darkness. Others spring from more private nightmares..."
One of New York City's largest children's hospitals, funded by 'private donations,' is being used to provide orphans as human raw material for some unspeakable purpose. This could have gone on for a long time, had not one of the nurses stumbled on part of the secret. She vanished, just another victim of the city's lawlessness, but leaving a worried and suspicious uncle. On another part of the globe, Moscow, amidst the ruins of a Russia blighted by pollution, war, hunger, and fear, there stands an age-old figure of unimaginable evil. Once he was called Koshchey Bessmertny, Koshchey the Undying, and he became the dark enemy of Russian fairy tales and folklore, a name to whisper when the moon passed behind a cloud. In the 1930s and '40s, they called him another name, and he became the sinister mind behind the deaths of millions in the Siberian Gulag. What he does not know is that the disapearance of a simple provincial nurse threatens to bring these loose strands together into the noose that may at last catch him. 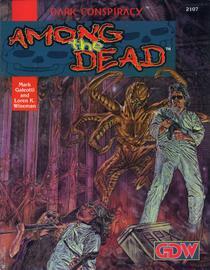 If, that is, the players are able to face and overcome the horrors waiting them...Among the Dead." 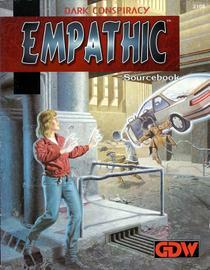 "The Empathic Sourcebook [for Dark Conspiracy] contains expanded and refined rules for the Empathy attribute and its related skills, as well as entirely new skills, and information concerning Empathy skills practiced by humanoid ETs who remain free from the Dark. Also included are more combat-related Empathy skills and descriptions of numerous organizations important to empathic characters, from psychic test labs to empathic secret societies"
"How do you open a portal to another place? How do people use proto-dimensions for rapid movement to a location miles away. If there is such a thing as a doorway to another reality, can it be locked? Why is it easier to dimension walk from Demonground? Are there safe havens in the proto-dimensions? Where did the proto-dimensions come from? Are there other worlds in the proto-dimensions, other races -- allies or enemies? What are the Plaguelands? These questions, and many others, will be answered in the Proto-Dimensions Sourcebook, Volume 1. There are rules for proto-dimensional travel by means of empathic power or by the use of technological devices far beyond the ability of humans to create. All the details of dimension-walking are covered, telling how to stay alive while doing it. Players will learn how to build an interdimensional portal -- or how to destroy one. 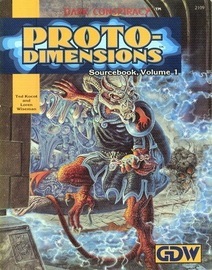 Further, the Proto-Dimensions Sourcebook describes 12 different proto-dimensions, ranging from tropical paradise to a sulphurous hell, from the vastness of a perpetual sky to surreal landscapes populated by creatures from out of a nightmare, from a world where everything is normal except for the color to a world where nothing is as it seems. If you are a Dark Conspiracy referee, you will be able to incorporate the proto-dimensions into your campaign with relative ease. If you are a player, your character can now take the battle to the enemy's backyard." "For as long as the icy winds have blown across the arctic plains, it has hungered after humanity, its bite the kiss of frozen death. Through the great ice age, the time of its greatest power, it hunted freely, its might unchallenged. But with the glaciers' disappearance, it retreated from the Earth. Since that time, it has yearned to return, to sate its bloodlust once more. For this ancient and evil creature, the stars are right and the time is now. To stalk the Earth again and sheath the land in a glittering blanket of the coldest ice, it returns." Folio-sized product with upgrades to bring Dark Conspiracy up to the d20 GDW "House Rules". "Take your characters to new heights of performance with this optional rules supplement for Dark Conspiracy. • Rules for playing younger, more highly-skilled characters. • Enhanced PC background options. • Expanded combat rules, allowing for true expertise with specific weapons. • An improved skill system. • Rules for creating Renegade Extraterrestrial PCs! • Everything necessary for expanding to a D20 task resolution system. • And an updated, full-color character sheet suitable for making either color or black and white photocopies..."
"Fang Island has long been a popular vacation resort for those wealthy enough to enjoy such things. The top-secret military base at its northern end has made the island even more attractive, adding a sense of security in a dark and sometimes deadly world. But now all contact with the island has been suddenly and mysteriously cut off, and is under military quarantine. No one is allowed to cross the cordon..."
A clever boardgame where the players work in cooperation, rather than in competition like most boardgames. "It is the very near future, and America is under siege by creatures of evil, creatures that feast on human suffering. Their minions spawned humanity's darkest myths — its stories of blood drinkers, flesh eaters, shape changers, and soul stealers. 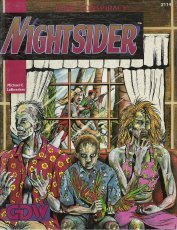 Legends speak of them as vampires, zombies, ogres, ghosts, and ghouls, but the reality is far worse than had been imagined. Now they haunt a ravaged nation, stalking its lonely city streets, prowling its ruined countrysides, striving always to drive humanity to madness and despair. But sometimes the hunters become the hunted. Sometimes the prey stands up and fights back. Even in these dark times, there are individuals who uncover the plots behind the nation's slide into ruin and work against them. In Minion Hunter, you become one of those individuals. While the dark minions pursue their evil plots, you train your mental, physical, and psychic abilities for battle, collecting equipment and contacts along the way. Then, when a dark encounter alerts you to the nation's peril, you work with your fellow hunters to root out and destroy the dark minions' plots. The best among you will become the most famous minion hunter. But you have to act quickly, or the minions will complete their plots and the country will fall completely under their shadow." • an 8-page rulebook, complete with game encounter tables. • a full-color, mounted game board with a map of Dark America and tracks for character careers and minion plots. • 10 pawns with full-color stickers. • a tablet of character sheets. • 100 paper money bills. This game was actually deliberately made to use the game boards we had in stock. GDW at one point was intending to go into more high-end board games, like a Star Vikings game with plastic pieces, and our print buyer found a great deal on these mounted hard game boards, so we had about 10,000 in our warehouse, and this game was meant to use them. It was a great little game. Actually, the cooperative component of the game came out of our in-house playtesting, and was not originally in there. It just came so naturally to us to want to cooperate to defeat the minions, that we got Les to add that in. I have played it a number of times with non-gamers in the years since GDW, and everyone loves it. I was a guest at a Con in Salt Lake City in '94 along with a couple guys from White Wolf, and we spent a lot of the weekend playing MH. They loved it. The only real problem with the game is the paper money. It's a pain to cut up, and comes in the wrong denominations. I usually just keep track of the money with piece of paper and pencil and keep the money "mint." 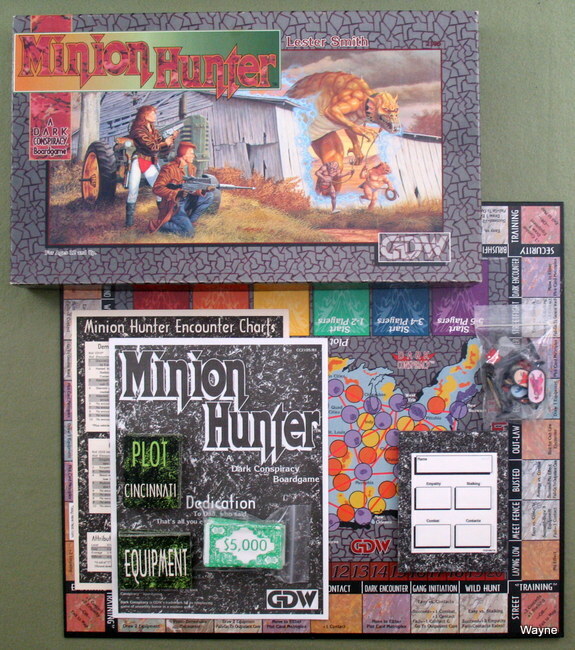 We never did make a second boardgame, although I really would have liked to do a MH expansion based on the "Proto-Dimensions Sourcebook" we put out, which would have been a natural. So when we went down there were still 5000 unused boards in the warehouse. "If you've played Minion Hunter until you know every encounter by heart and have memorized every card, this kit will inject a new level of mystery into your play. If you've just begun playing Minion Hunter, this kit will provide you with options and background to make your play more satisfying than ever. 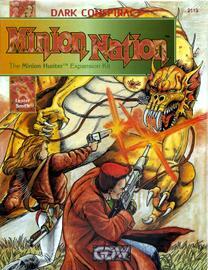 If you've never played Minion Hunter... you're missing out on a good time. * New rules options, for grimmer, yet more cooperative games. * Expanded encounter tables, for further variety in play -- including a table of random Plot Card results! *16 new Equipment Cards, including Empathy-enhancing items, a second Wildey Wolf (for two-fisted shooting! ), and even minion equipment you can capture at Dark Encounters! 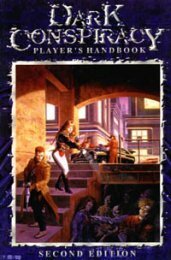 * Designer's Notes, with topic by topic, space by space, encounter by encounter comments to further flesh out your understanding of Minion Hunter and its treatment of the Dark Conspiracy horror RPG world..."
The second edition is published by Dynasty Presentations Inc. and Lester Smith, post-GDW. The one rulebook from the 1st edition was split into Player & Referee books. 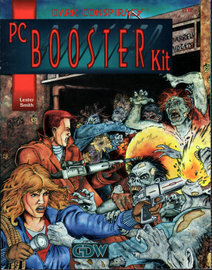 Both were released in Basic & Master Editions (which added the content from 1st edition supplement books to the rulebook). "Shapes that rip and tear. Shadows that live in corners. Windows in space and time that lead to realms of madness and decay. A dark, lurking horror that feeds off the echoing anguish of a billion souls. 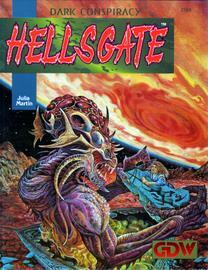 When an ancient, brooding evil is released from its dimensional prison, humanity's worst nightmares come to life. Set in the near future, the world of Dark Conspiracy is fraught with peril and challenge. Can you turn back the forces of darkness? This Player's Handbook contains all the rules to create and run characters in the world of Dark Conspiracy, Including material from previous released Dark Tek and Empathic Sourcebook. This book contains revised character sheets, expanded equipment list and in-depth empathic abilities section." 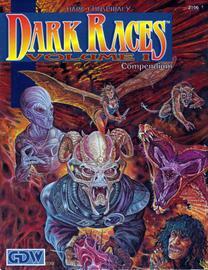 "This Referee's Guide contains material from previously released Dark Races and Proto-Dimensions. This book contains a large section on creatures and new dimensions for players to explore. You will find all the rules, start-up adventures and creatures from the dark abyss needed to play in this dark game of sci-fi horror." 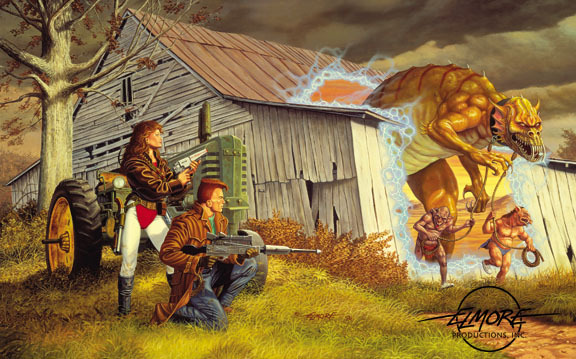 "This three-paneled referee's screen (33" x 8.5") is beautifully illustrated by fantasy artist Larry Elmore. This Referee's Screen has everything a Referee needs for quick reference to speed up game-play. 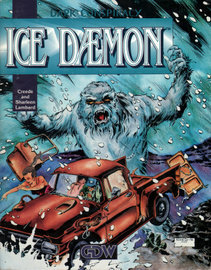 Also included is a 48-page book with material from the previously released Ice Daemon and Nightsider adventures, both of which are sure to frighten and delight horror role-players of any age." 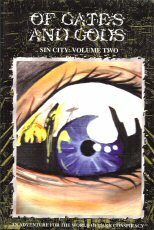 "Welcome to New Centennial City, or "Sin City" as the people who live here call it. New Centennial City is a new Hong Kong - a place of commerce, opportunity and dark secrets. It is a foreboding place, crouched somewhere in the shadows between Tim Burton's Gotham and the Los Angeles of Ridley Scott's Blade Runner. 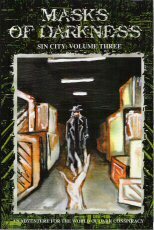 New Centennial City is a place where powerful men prey on the weak-minded with disastrous results. A series of violent crimes and a mysterious explosion, draw the players into the clutches of the Calendites, a modern-day Mayan cult led by the enigmatic Ethan Rayne. 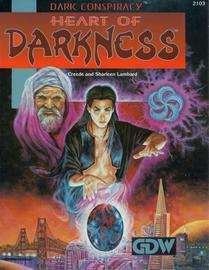 In trying to learn its secrets, the players are caught up in the frenzy of impending doom. The stage is set! The end of the world is nigh!" "Something strange just crashed into a heavily populated region of NewCentennial City and someone is trying to keep it a secret. As the players investigate, they will be introduced to the subculture of the Citadel. The Citadel can be best described as the personal playground to the elite of New Centennial City. Big parties, big business and big money flow through this area at neck-breaking speeds. The Citadel is dangerously out of control. Greed and corruption can be found on every corner. Certain elements attempt to change the world as we know it. What is happening behind the scenes and can your party stop it before it's too late? Talk about amateurish production/editing. Product number 1020 on the spine. Product number 1110 on the back cover. Neither is correct. This should be DPI 1120. Something is happening behind the scenes in New Centennial City. 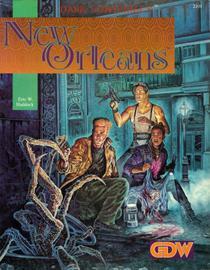 A gang war has erupted in the Projects and an influenza epidemic sweeps the city. Meanwhile, a man has gone missing and no one seems willing to help find him. The players get asked to help and inadvertently get pulled into a web of lies, deceit and confusion. Masks of Darkness introduces several new underground ernpathic cells that are active in New Centennial City. They, together with the players, will work together to uncover the truth that lurks behind the facade of everyday city life. If the players aren't careful, they could get more than they bargained for." "The Dark Conspiracy game in all forms is owned by Dark Conspiracy Enterprises Copyright 1991 - 2000 Dark Conspiracy Enterprises. 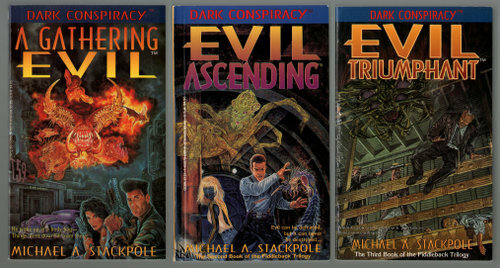 Dark Conspiracy is a trademark of Dark Conspiracy Enterprises." 47	Dark Conspiracy: Special Insert!